Do you like sitting at the blackjack table in Vegas? Try your hand at the hottest new blackjack game to hit the app store. This classic game of 21 will keep you doubling down and getting huge payouts from the minute you lay down your first bet. Enjoy live blackjack results from the house as you keep doubling down! When you come to this online blackjack casino game, you will enjoy real life game play. Check your blackjack charts - we're ready to roll! Beyond the traditional poker games, black jack operates by beating the house itself in a calculated game of 21. - Awesome training programs to hone your skills for Vegas! 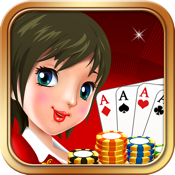 Download this blackjack game today and take your skills to the next level!